Starting in the post-war socio-political milieu and throughout the second half of the 20th century, Britain witnessed dramatic expansion of its Higher Education system. This is very much related to the ‘modernisation theory, which some 40 years ago predicted that the development of industrial societies would require workers to be ever more highly educated and occupational roles to be allocated increasingly on the basis of achieved rather than ascribed characteristics’ (Boliver 2011, p.230). This post will review a set of policy efforts made between the 1960s and the 1990s. The latter were instrumental in transforming the ‘restricted growth phase’ of universities in the 1950s into the current ‘mass tertiary education’ paradigm (Boliver 2011, p. 233).Here all the policies related to the expansion of Higher Education are considered ‘social policy’. Needless to say, among these policies there are some that have a strong social connotation, such as the introduction of mandatory maintenance grants for students to cover fees and living costs in 1962 (Blake 2010). Nevertheless, expansion policies are considered as a whole, as Blanden and Machin argue (2004, p. 230) ‘[that it is thought that] increased educational opportunities are associated with greater equality of opportunity as university places offer greater potential for the advancement of students from poorer backgrounds’. The latter is fundamental to understanding the philosophy underpinning the policy decisions regarding the growth of tertiary education, a phenomenon closely associated to successive conservative governments. ‘Conventional political wisdom’ states that mass participation in Higher Education will reduce the socioeconomic gap (Boliver 2011, p. 229). Thus, mass participation was accompanied by ‘the highest levels of support’ to students between 1977 and 1984. However, university growth was later prioritised at the expense of ‘the generosity of student support arrangements’ (Blanden and Machin 2004, p. 233). Thus, in the early 1990s, just as the participation rate increased, a trend started to charge students for their educational costs. It is argued (Blanden and Machin 2004, p. 233) that the latter began by freezing maintenance grants in 1990 and continued until today, with Parliament passing Lord Browne’s recommendations in 2010 stating that ‘students should pay at least £21,000 for a three-year degree’ (Blake 2010). The ideology underpinning the (social) policies explained above is very much related to a central concept in late capitalist ideology: education-based meritocracy. In this sense, the expansion of Higher Education per se is seen as the main force for promoting social mobility, thus relegating funding and support for students to a secondary plane. 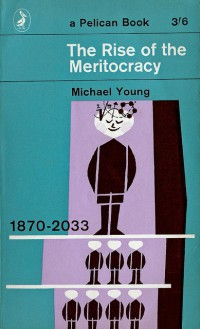 Education-based meritocracy, developed upon Michael Young’s satirical theorisation of a principle of distribution of rewards by ‘merit’ (Young 1961; c.f. Lister 2006, p. 232), is concerned about ‘the relationship between individuals’ class origins, their educational attainment and their eventual class destinations’ (Goldthorpe 2003, p. 234). In a nutshell, the theory is a nuanced version of Young’s ‘meritocratic formula’ (IQ + effort=success) (c.f. Lister 2010, p. 237). Education-based meritocracy states that educational expansion (understood as a solution for ensuring the educational equality of education) weakens the relation between individuals’ class origins and class destinations. Thus, when a society moves in the direction of an education-based meritocracy, social mobility is enhanced. ‘Where it doesn’t, it will be for legitimate ‘meritocratic’ reasons’ (Goldthorpe 2003, p. 235). Since education-based meritocracy appears to reconcile social efficiency and social justice (Goldthorpe 2003, p. 235), its ideals have attracted thinkers 1 and politicians alike. However, a considerable number of people have criticised its ideological assumptions. Scholars, journalists, thinkers and the public in general 2 have questioned the aprioristic assumption that education-based meritocracy reduces inter-class inequality by boosting social mobility. In this sense, empirical and theoretical research on the concept of social class has been critical in order to assess the effect of ‘meritocratic’ policies in reducing the socioeconomic gap. Academia has generated substantial criticism of the effects of the expansion of Higher Education on social mobility, challenging the ideological assumptions behind education-based meritocracy. Thus, sociologists and social policy theorists coming mostly from the field of the Sociology of (Higher) Education have developed two main strategies to tackle the issue. On the one hand, a set of researchers using empirical research methods and operating mostly under realist ontological assumptions has provided evidence and tools to assess the phenomenon (for the United Kingdom, see Goldthorpe 2003, Blanden and Machin 2004 and Boliver 2011; the contributions of Raftery and Hout 1993 are worth mentioning for the Republic of Ireland). On the other hand, theorists such as Pierre Bourdieu made a seminal contribution to the understanding of how educational systems help to consolidate and reproduce class positions in social systems, thus shedding light on how educational systems affect power relationships (Bourdieu and Passeron 1970, p. 70). Besides, egalitarians such as Ruth Lister (2006) have levelled harsh criticism at the meritocratic ideal, developing theoretical statements of its potential (and actual) effects in terms of social justice. Before analysing these critiques, it is noteworthy that none of them are explicitly Marxist. Instead, I call them ‘Marxist-informed’ critiques. This means that both critiques assume the ontological position that social stratification is real and that its operationalisation through the concept of social class as an analytical tool is central to understanding social change (Lister 2010, p. 59). In the latter sense, a group of scholars taking an empiricist approach to understanding the effect of educational expansion on social mobility have argued that social movement ‘should be studied […] between bounded groups defined in class terms’ (Turner 2006, p. 46). Studies of this kind use social class as a categorisation tool whereby they analyse longitudinal data of two or more cohorts in order to develop a statistical model that shows individuals’ chances of accessing to Higher Education institutions (Raftery and Hout 1993, Blanden and Machin 2004, Boliver 2011). John Goldthorpe goes one step further and predicts individuals’ chances of being found in a ‘different class position’ according to their ‘educational attainment’ (2003, p. 236). Their results argue that social class inequalities in British Higher Education have been maintained. Goldthorpe even states that ‘the theory of education-based meritocracy might appear to offer proofs to be illusory’ (2003, p. 239). This results support both Bourdieu’s and Lister’s criticisms. Regarding the former, empirical results support the broader idea that educational systems consolidate and reproduce social structure. Concerning the latter, empirical results support the idea that the meritocratic system not only reduces socioeconomic inequalities, but also increases them. Moreover, Lister argues that meritocracy legitimates inequality, as ‘meritocrats believe they deserve whatever they can get’ (2006, p. 234). Empiric results showed above support the idea that educational expansion policies in Britain do not have an effect on social mobility, at least when student-funding support is not implemented. Thus, by using social class as analytical tool, Marxist-informed researchers have developed evidence-based critiques to the effect of meritocratic models on socio-economic inequalities and have helped to understand how power relationships are consolidated and reproduced in a ‘meritocratic’ environment. However, the studies mentioned in this paper assess the effect of educational expansion policies in the context of a nation-state. In the case of international student mobility, recent research (Findlay et al. 2012) suggests that social class reproduction will persist as an issue, with the aggravating factor that policy is an added constraint to tackle the issue. This new Higher Education paradigm will force the development of new critical social research practices, in which ‘social class’ as analytical tool will may still play a major role. Blake, Heidi, 2010. Grants, loans and tuition fees: a timeline of how university funding has evolved. The Telegraph. Available at: http://www.telegraph.co.uk/education/educationnews/8057871/Grants-loans-and-tuition-fees-a-timeline-of-how-university-funding-has-evolved.html. Blanden, Jo and Machin, Stephen, 2004. Educational inequality and the expansion of UK higher education. Scottish Journal of Political Economy, 51(2), pp.230–249. Boliver, Vikki, 2011. Expansion, differentiation, and the persistence of social class inequalities in British higher education. Higher Education, 61, pp.229–242. Bourdieu, Pierre and Passeron, Jean-Claude, 1970. La Reproduction. Élements pour una théorie du système d’enseignement, Paris: Les Editions de Minuit. Findlay, Allan M. et al., 2012. World class? An investigation of globalisation, difference and international student mobility. Transactions of the Institute of British Geographers, 37(1), pp.118–131. Social Mobility Foundation., 2014. Press Release: Radical reforms needed to make Britain a meritocracy says Conservative MP Dominic Raab. Available at: http://www.smf.co.uk/radical-reforms-needed-to-make-britain-a-meritocracy-says-conservative-mp-dominic-raab/. Goldthorpe, John, 2003. The myth of education‐based meritocracy. New Economy, 10(4), pp.234–239. Lister, Ruth, 2006. Ladder of opportunity or engine of inequality? The Political Quarterly, 77(1), pp.232–236. Lister, Ruth, 2010. Understanding theories and concepts in social policy, Bristol: The Policy Press. Raftery, Adrian & Hout, Michael., 1993. Maximally maintained inequality: Expansion, reform, and opportunity in Irish education, 1921-75. Sociology of Education, 66(1), pp.41–62. Turner, Bryan, 2006. The Cambridge dictionary of sociology, Cambridge: Cambridge University Press. Young, Michael, 1961. The rise of the meritocracy 1870-2033, Bristol: Penguin Books. *Note: This article gives the views of the author, and not the position of SIRIS Lab, nor of SIRIS Academic. Please review our Comments Policy if you have any concerns on posting a comment below. Information about Featured Image: “A485(The Rise of the Meritocracy)” by danielweiresq, 16/06/2013. Available here. It is worth noting the impact of certain think tanks in the development of ‘meritocratic statements’. For instance, the Social Market Foundation recently published The Meritocrat’s Manifesto (2014), written by the Conservative MP Dominic Raab, which states that equality of opportunity must be achieved by meritocratic means.